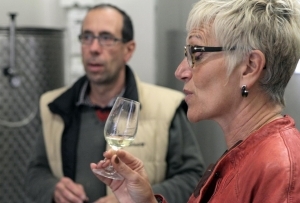 Because Colette used to teach wine at the unversity of Burgundy (she recently retired), she will share with you the key which will introduce you to the vineyards. She will tell you about “terroir”as well as the vineplants, Pinot Noir and Chardonnay , the vintages, the vinegrowers work. You will see all the growing places of these famous grands crus vineyards : Chambertin, Clos Vougeot, Romanée – Conti, Montrachet or Corton-Charlemagne. Toghether you will explore the wineries and you will attend a sensory wine tasting experience like no other, learning how to use your eyes, your nose, your palate and your memory… Not every winery welcomes visitors but Colette knows where to lead you for you to taste the best !